Finally, last stop of the vacation: New York City! My brother and I stayed there for four days and three nights and we had a pretty great time! That was my fourth time being in the City, but my brother had never been there before, so mostly I just showed him around (with my limited knowledge about the city myself) and went to pretty much all the places that I have visited. Here’s my story. It was my first time visiting both places. During my first two visits last summer, the parks were still closed for renovation due to the damages caused by Hurricane Sandy. My third visit was last year’s Thanksgiving, and I’m not sure if they were already open at that time, but from what I remember, my friends and I weren’t even thinking about going there in the first place… so yeah, another trip to NYC without a visit to the statue. Anyway, my brother and I went there on the third day of our stay and it turned out to be really enjoyable! Both parks exceeded my expectation–though I’m not quite sure what my expectation was, haha. My only regret was that I did not go there earlier (we headed out from our place at 1 PM!) and did not book the tickets in advance. I find myself really enjoying the free audio tour for my visit at the Statue of Liberty. I learn a good amount of fun information related to the statue while observing it directly, so that was nice. For instance, the second engineer who worked on the statue construction, after the first one passed away, was Gustave Eiffel, who–from the name, you’ve probably guessed it right–designed the Eiffel Tower. The audio tour also mentioned some meanings of the statue’s specifications in terms of its size, number of “spikes”, the way it is oriented, to name a few. I don’t know if the Americans feel the same, though, since they may have already known some of the historical facts beforehand. The monument, featuring my forehead. The next stop after the Statue of Liberty was Ellis Island. 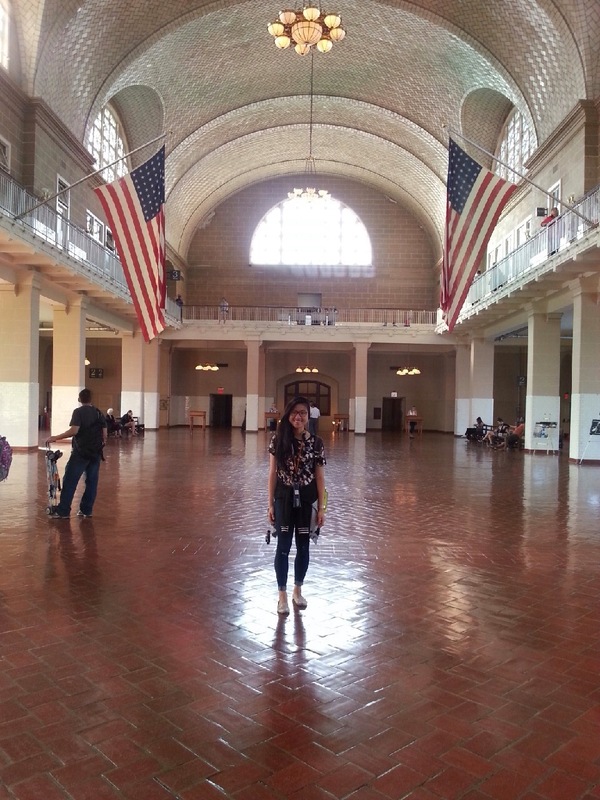 There, I went to the Ellis Island Immigration Museum, where the immigrants in the 1800s were legally processed when they first arrived in the United States. The museum also provided free audio tour, which unfortunately I didn’t use much, since I only had roughly an hour before the museum closed. I went to the main exhibit–Through America’s Gate–which I found really informative; the exhibition basically guided visitors on a series of step-by-step immigration processes before an immigrant was admitted legally to the United States. I especially like some anecdotes (in forms of quotes) written on some of the description boards. They kind of make you, as a visitor, get what they were feeling when they first came to a new land, and to me, that was just charmingly romantic! The Registry Room, a.k.a. The Great Hall. 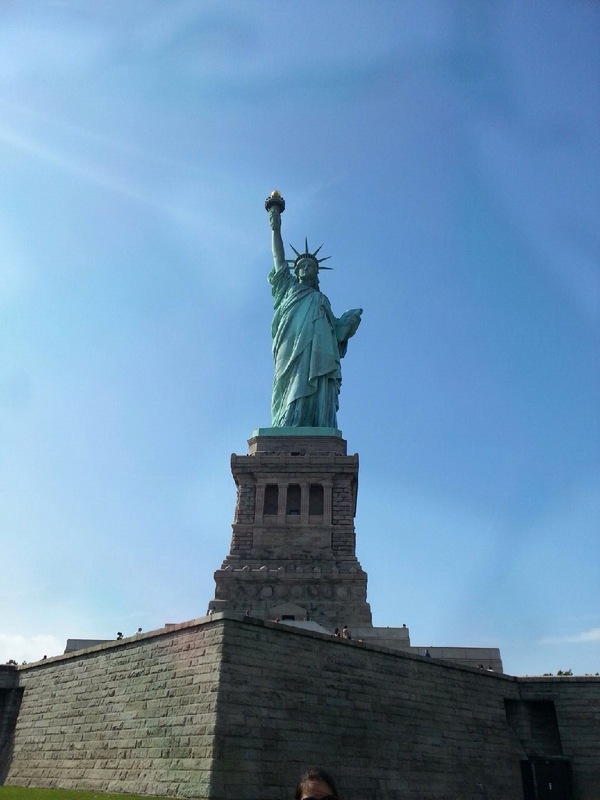 Without doubt, the Statue and Liberty and Ellis Island are two of the most famous tourist attractions in New York, but let me just say it again: most definitely recommended! Not only because of the usual trite reason that you have to go there just for the sake of taking pictures with arguably the most famous landmark in the world, but also because 1.) it’s a nice way to escape the hustle and bustle of New York City during your vacation and 2.) you get to learn so many things and for me, it kind of provides me–who is not American–with a new way of looking at United States, both as a country and as a people! I tried to be as stingy as possible for this trip, so when I stumbled upon City Rooms NYC at Expedia, not even bothered to do more research, I booked a room there. When I arrived in NYC, I was stupid enough not to put the actual address of the hotel on Google Maps while looking for directions, assuming that it was a well-known hotel and recognized by the app. It turned out that the hotel has only been around for two months and I actually tried to check in at another place that Google Map pointed me to, only to have the receptionist telling me that it was the wrong hotel. So my brother and I dragged our suitcases for another 14 blocks, and frankly, I didn’t expect the place to be almost perfectly sandwiched between a relatively unknown Asian restaurant and a 7-Eleven. Bo with his adorable teddy bear haircut! 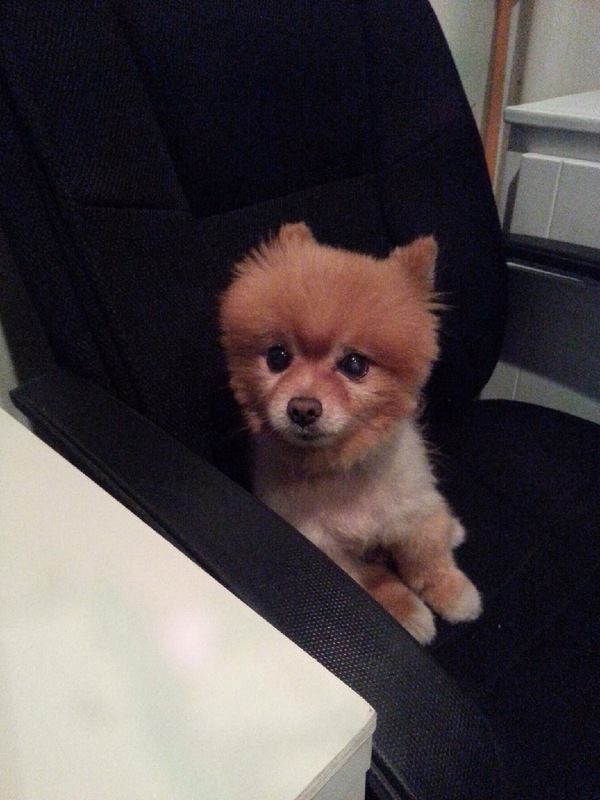 This cute little fella belongs to one of the co-owners of City Rooms. City Rooms NYC is a hybrid between a hostel and a hotel, which was a completely new experience to me–definitely much more comfortable than a regular hostel with a spring bed in each air-conditioned room, yet guests have to share semi-private bathrooms and toilets (and those are all clean, in case you’re wondering). It has a pretty good location on the 8th Avenue between the 28th and 29th Street. The room where I stayed also had a sink, a safe-deposit box, and a fridge. It also provided me with unlimited wi-fi access and drinking water, as well as coffee (during the day) and tea, which I thought was really nice. The owners and staffs were super helpful and friendly–one of them even had the cutest Pomeranian I’ve ever seen in my life, which was another good thing about the place. That said, however, the room is small. My brother and I each had a suitcase and trying to get things out of our suitcases was quite a hassle due to the lack of space. There was also no elevators, which means that you have to bring your suitcase up and down the stairs, though one of the guys kindly brought it for me. The bottom-line? If you really want a cheap (though not necessarily much cheaper) place to stay that still has the comfort and location, you may want to consider the place. However, if you’re willing to chip in some extra cash (which, if you get a good bargain through Expedia and other similar sites, the price difference wouldn’t be much at all) for a much spacious room and your own private bathroom and toilet, definitely go for a legit hotel. Book the ticket in advance! Seriously, it would save so much time if only I booked the ticket online. The line to purchase the ticket (at Castle Clinton National Monument, Battery Park, NY) was pretty long, though fortunately, it was moving quickly. It probably took me around 15 minutes before I could get my ticket at around 2 PM. And then, you would still have to wait in line for security check and getting on board the ferry to both the Statue of Liberty and Ellis Island (roughly around 30-minute wait), so I think it would be nice to save up some time since there are so many things you can see at both places. The website provides extremely clear and thorough information on how to plan your visit, so you should definitely check that out. Also, if you book the ticket super early, you may get the pedestal and crown access to the Statue of Liberty, which I think will be a great experience! Ditch the cab and take the Air Train and public transportation (either bus or subway). The taxi from the airport to the area where most major hotels are located at typically costs around $60 or even more! The Air Train costs $5 per person and take you directly to your terminal from your preferred means of public transportation, while each subway or bus ride costs $2.5 per person. You can purchase the general Metro tickets that work for both subway and bus at any stations, I think, while you can purchase the Metro ticket that works for Air Train at the Air Train “terminal” before you board the train. Also, thanks to technology, you can easily get directions from/to the airport using Google Maps, complete with the time and bus/subway route number. I personally don’t enjoy New York City that much. Don’t get me wrong, the city is obviously anything but boring! There are so many exciting things from definitely a wide range of topics and interests going on here. I guess it’s just that everything here feels to be a hectic “race”: people rushing from one place to another, vehicles honking at one another trying to beat the traffic light, innovations keep popping out in no time–and the list goes on. Going there every once in a while is definitely fun, but as for now, it’s just not the scene I want to live in! So… with that being said, I guess this post marks the end of this Summertime Sibling Bonding Trip series! Overall, the trip was great! It feels nice to spend some time with my brother, especially now that I’m studying in the States and do not get to see him often (probably only twice a year?) and to finally have the chance to have an actual break after spending the previous three months on campus. Edit: By the time this post is published, it’s been a month since the first day of classes!